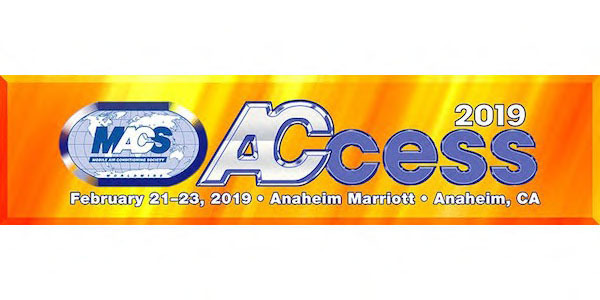 MACS has announced that exhibit space for its upcoming 2019 Training Event and Trade Show, A/Ccess is sold out. The MACS 2019 Training Event and Trade Show will take place Feb. 21-23 at the Anaheim Marriott in Anaheim, California. MACS Trade Show day will take place from 10 a.m. to 4 p.m. on Friday, Feb. 22 and will feature 72 exhibitors and 84 booths. “MACS is pleased to have so many robust mobile A/C-centric exhibitors from around the globe bring their product expertise to our trade show for attendees to discover,” said Elvis Hoffpauir, MACS president and chief operating officer. Attendees are reminded to make their MACS Training Event hotel reservations at the Anaheim Marriott by visiting the MACS website under attendee information or call 877-622-3056 before the room rate cut-off of Monday, Jan. 21. Attendees can save money by pre-registering by Friday, Feb. 8, through the MACS website or by phone at 215-631-7020 x 0. Training Event registration fees will be higher on-site at the show.